Yes, it is possible to have a tasteful home movie room. 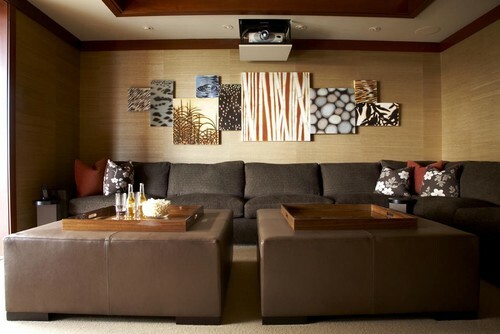 What are some decorator secrets for an attractive dedicated home movie room? This verbiage has less-than-tasteful connotations, I am going to call it like I see it. Home Theater draws an image of a soldier-row of lumpy leather recliners with built-in cup holders. What about calling it your movie room? It sounds so much more attractive already! A good Audio Video specialist can help you decide what type of equipment fits your demands and your budget. If possible, have your room pre-wired for the type of equipment before your walls are installed. I personally like a front-projection system in a dedicated (completely light-controlled) movie room, see the little projector mounted on the ceiling below? Visit a good A/V demonstration room to see what you like and what fits your parameters. Ask your A/V specialist what the optimal viewing distance is for the system you have selected. Obviously, the larger the screen, the further away the optimal viewing distance. This is where your main sofa should be placed. This is not the time to go it alone. Get an experienced designer involved before your installation is purchased. If you are on a budget, you can not afford to make a mistake. 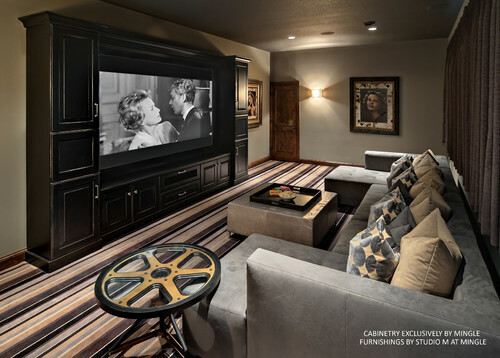 Working together, your designer can suggest a floor plan and soft furnishings that will enhance the use and beauty of your movie room, so that it will be one of your favorite rooms in your house. #4 Pad and cover your walls with fabric for optimal sound. This is a job for an experienced professional. Don’t forget extra sound-proofing between floors. #5 Carpet is a must for any good audio system to sound its best. 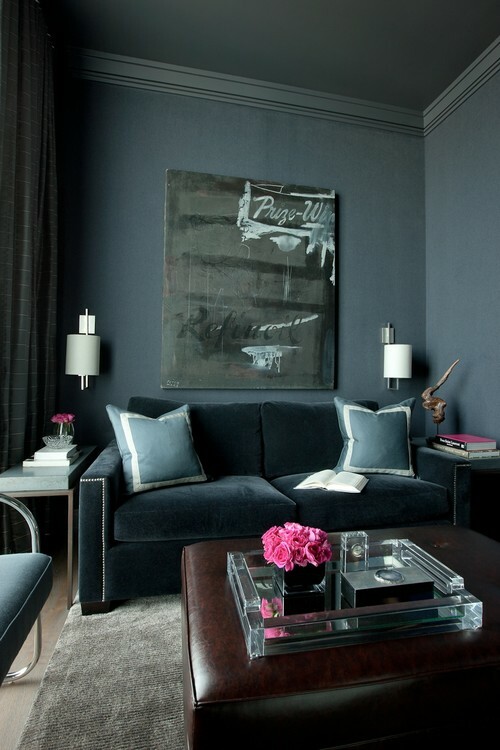 #6 Use operable (hand-drawn) draperies with full black-out lining for complete light control. #7 Good-looking case goods/built in cabinetry for housing components. Think a full-sized sofa, some lounge chairs, and ottomans. No hard-surface coffee tables, which are uncomfortable for foot-propping, and will improperly reflect sound waves. 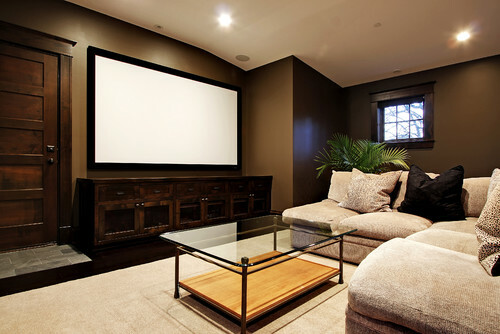 A better look is to have your dedicated movie room look more like a regular family room, tailored around the movie screen. As tempting as this may be, don’t put anything else such as pool table, ping-pong or appliances in the same room. If possible use an adjoining area nearby. Ice machines, even the most expensive, make distracting noise and should never be placed in the movie room. 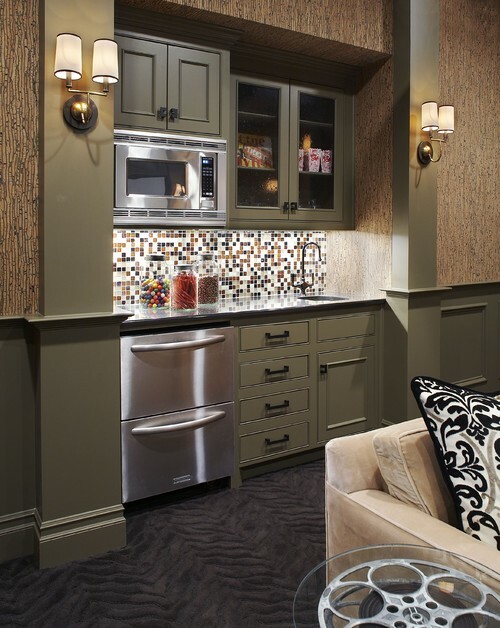 Find a place in a nearby area to install the wet bar, ice machine, a small fridge, etc. It might sound like a fun idea at the time, but a ping-pong table or pool-playing are not really compatible activities with movie-viewing, and as such really don’t belong in a dedicated movie room. 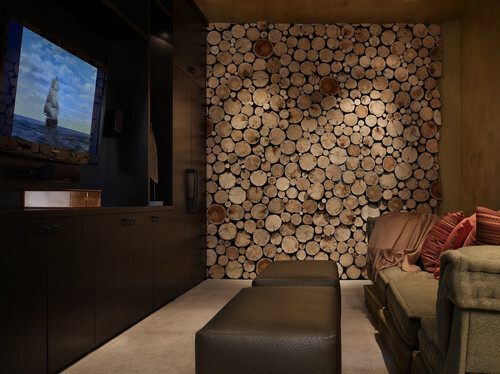 #10 Dimmers on all lights in a movie room. 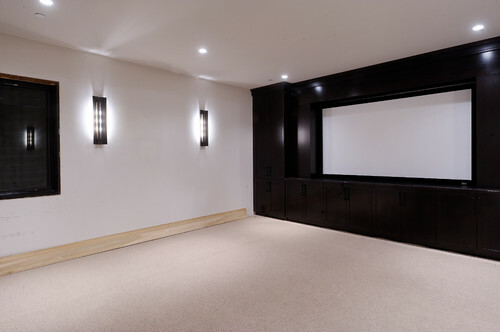 Make sure that you can easily and quickly access them when entering and exiting, because a dedicated movie room is dark without natural light. This is an overlooked tip that will enhance your enjoyment of the room. 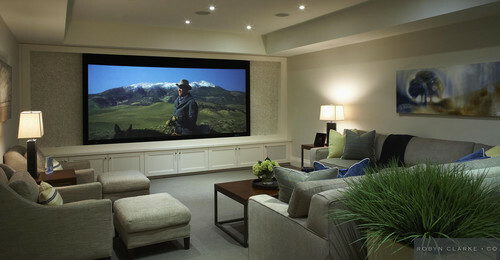 Do you have a movie room, or would you want one? What are the important elements for you in a room like this? This entry was posted on August 25, 2012 by Ellen at Color Calling. It was filed under Decorating trends, Residential styling and was tagged with Audio Visual, home theater, media room, padding walls, sofa.